The Real Jenn C.: Dorothy Rocks! Dorothy is a ten-year-old volunteer who works with me almost daily at Austin Pets Alive! Tarrytown. She cleans the cat boxes, does dishes, sweeps, washes windows, fills bowls and snuggles the cats that are up for adoption. She also inspires me to be a better person. Below is an email she sent to everyone she knows. I am a volunteer at the new Austin Pets Alive in Tarrytown next to Texenza Coffee on Windsor Road. 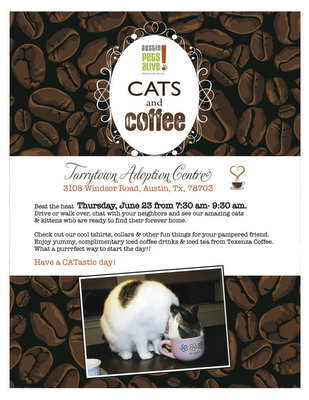 Next Thursday, June 23, 7:30 - 9:30 a.m., Austin Pets Alive will host a free "Cats and Coffee" get-together to introduce the neighborhood to the great kittens and cats of all kinds that need homes. I will be out of town next week, but really hope you will stop by and meet the animals and the women I work with -- Jenn and Lexa, the store managers. If you are not ready to adopt a new furry friend, you can support APA by purchasing a cool T-shirt or other fun gift items (good for camp care packages!). Please say hi to all the cats for me!